Minestrone is a staple in my house, it’s healthy, loaded with vegetables, and hearty. It’s a great way to use up whatever vegetables you have in your crisper, and the rest of the ingredients are things that you probably already have on hand in your pantry. I don’t have a “recipe” for minestrone, I make it with what I have on hand. The key to great minestrone is starting with aromatics, then adding a combination of vegetables, beans and starch (optional). You can finish the soup with a little olive oil, fresh herbs, cheese or croutons. Serve with a salad or crusty bread (or both) – and you have a healthy and satisfying meal. Aromatics are the base flavors of your soup. Choose a few based on what you have in your fridge or pantry. 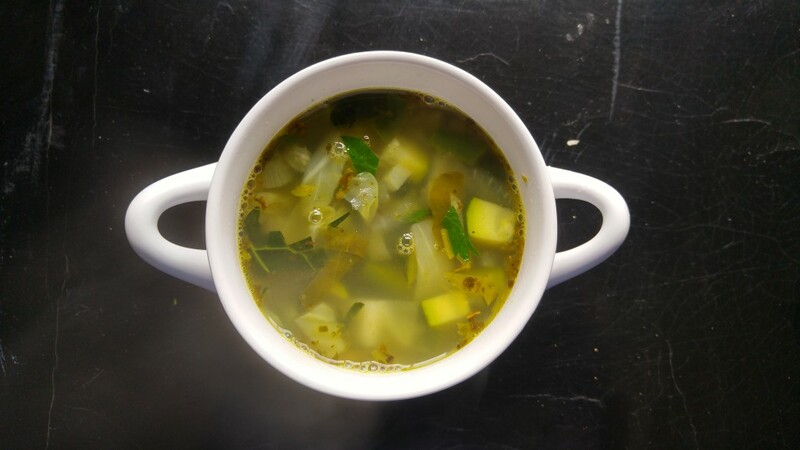 Good aromatics for minestrone include: garlic, onion, leek, fennel, shallot, and celery. Add complexity to your minestrone by adding dried herbs like: oregano, basil, thyme, marjoram, bay leaf and crushed red pepper. I make two types of minestrone, red and green. Red minestrone uses canned diced tomatos and water or broth. Green minestrone is tomato-less and uses vegetable broth as it’s base. If you happen to have a parmesan rind, you can throw that into the broth as well. This is a classic Italian method of adding richness and flavor to soups while getting one last use out of your chunk of parmesan. The possibilities are practically endless when it comes to the vegetables that you can add to minestrone. All of these are excellent options: carrots, cabbage, spinach, chard, kale, green beans, peppers, zuchinni and yellow summer squash. Adding beans and/or pasta, rice or potatoes turns the soup into a hearty meal. Good options include: garbanzo beans, white beans, kidney beans, potato or pasta. While the soup is complete and delicious without any finishing touches, you may want to add one or more of the following right before serving to add additional richness, texture or complexity: a drizzle of olive oil or balsamic vinegar, fresh basil or parsley, a dollop of pesto or olive tapenade, minced anchovies, grated parmesan or croutons. Step 1 – Add a splash of olive oil to a large soup pot or dutch oven, bring to medium-high heat and add aromatics. Sautee for ~5 minutes until vegetables are wilted and have released some of their liquid. Step 2 – Add dried herbs and salt and pepper and sautee for another 30 seconds. Step 3 – Add broth. I typically add enough broth to fill the pot 2/3 – 3/4 of the way full. If necessary, you can add additional broth later. If using canned or fresh tomatoes, add them at this stage as well. Step 4 – When broth comes to a boil, add pre-soaked dry beans (if using). If using canned or pre-cooked beans, I wait until later to add them. Cook until beans are nearly al dente, then move to Step 5. You will likely need to add additional broth as it is absorbed by the beans. If you are not using dry beans, you can skip this step. Step 5 – Add any longer-cooking vegetables (such as carrots, peppers, potato, and kale) and pasta and cook for ~10 minutes until softened. Step 6 – Add remaining, quick-cooking vegetables (spinach, cabbage, summer squashes) and cook for another ~5 minutes. Add additional broth as needed for desired consistency. Step 7- Remove soup from heat and stir in any fresh herbs, lemon juice, additional olive oil, etc. Step 8 – Serve with any additional garnishes, additional fresh herbs, cheese, croutons, etc. Heat olive oil in large soup pot to medium heat. Add leek, shallot, and celery and fennel and cook for 3-5 minutes until vegetables are beginning to soften and release some of their liquids. Add garlic, dried herbs and zuchinni and season with salt and pepper. Cook for ~2 more minutes, then add broth* and bay leaf and bring to boil. Boil for 5 minutes, then add pasta and cook for another 8 minutes. Add beans, spinach, cabbage and cook for another 2-5 minutes. Remove soup from heat and stir in celery leaves, parsley and lemon juice (if using). Leftovers store well in the fridge or the freezer. *If you happen to have a parmesan rind, you can add that with the broth as well. It adds great flavor and richness without adding a lot of fat or calories. Just pull it out before serving.